economic history of Indonesia, from the first colonial state to the appointment of Habibie after the Suharto meltdown, from Simons (Libya: The Struggle for Survival, not reviewed). grabbing material and also a humane, progressive outlook; grim in that the Indonesian people, all 200 million of them, have had a very rude time of it, since the Portuguese first set up camp there in the 16th century right up until today. 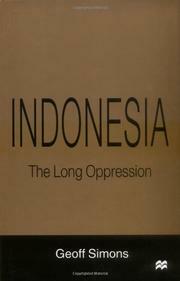 Simons starts his coverage with a gruesome overview of human-rights abuses—mass killings and mass arrests by the government are simply a part of everyday life in Indonesia—and the economic degradation of the Indonesian citizenry during the period of Suharto’s rule, aided and abetted by American and European political interests. It is impossible for Simons not to simmer with rage as he piles up evidence upon evidence of torture and murder, at the army's hands, of a broad swath of Indonesians: anyone in opposition to Suharto and plenty of innocents as well—a cruel sampling that seemingly touched each of the country’s 300 ethnic groups. Using ample documentation, Simons demonstrates just how culpable the US is for the bloodletting (conservatively estimated at 250,000 dead civilians) that brought Suharto to power, as well as for the arms dealing and the political and economic stranglehold that kept him in power for 30 years. Finally, Simons argues that sheer corruption and political sycophancy brought on the turmoil that capsized the regime, only to have it replaced by Suharto's lieutenant. An excellent country profile and a jarring reminder that Indonesians continue to fight for democratic rights today, something not lost on the East Timorese, the latest, most public victims of Indonesian aggression.